In the last two decades, global economic growth has led to a tremendous increase in the number of vehicles in almost every corner of the world. Reports showed that in cities, most high-rise apartment buildings have difficulties managing their parking spaces. ID card issuing, billing, entrance control and payments made the entrance procedure very inefficient. Traditional smartcard management systems limit the access to those who hold an allocated smartcard. 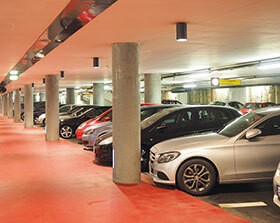 Dahua has launched a new intelligent car park solution based on video surveillance and video analytics technologies. It is integrated with the company’s background smart analysis system DH-DSS4004-EMS. The entrance control function of the smart park saves labour costs and delivers a much easier and safer entry experience. The Dahua Smart Car Park Entrance Control Function is designed with four essential components. Efficiency is enhanced using ANPR technology. Authorised vehicles will be identified by the camera which reads car licence plates and controls the gate. For visitors, the VTT201 video intercom is used. The ANPR cameras have a recognition rate higher than 95% and cover all licence plates of European countries. No loop in the system also simplifies the installation. The Dahua NVR5208-8P-4KS2 supports 4K ultra HD resolution (3840 x 2160) recording, live viewing and playback. If you use the refined search function, information including the vehicle picture, licence plate, entry and exit log, and video will be displayed. Based on Windows management software, the background smart analysis system DH-DSS4004-EMS is especially designed for the management centre. It is cross functional, easy to use, and cost-effective. The management centre can respond to emergency calls from the intercom, support search of video and image by date/time/licence plate number from storage. The Entrance Control Function of Dahua’s Smart Car Park Solution delivers high efficiency and safe entry for residential compounds. The solution is also scalable and able to expand with infrastructure growth and is flexible enough to handle technology upgrades.